The Minto Flats State Game Refuge encompasses approximately 500,000 acres and is located about 35 miles west of Fairbanks between the communities of Minto and Nenana. The refuge was established by the Alaska Legislature in 1988 to ensure the protection and enhancement of habitat, the conservation of fish and wildlife, and to guarantee the continuation of hunting, fishing, trapping, and other compatible public uses within the Minto Flats area. 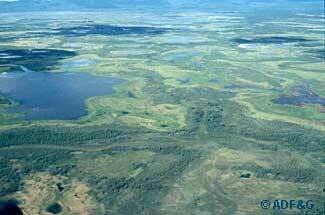 Minto Flats is a large wetland complex lying along a northerly loop of the middle Tanana River in interior Alaska. The area is fed by waters from the Tatalina, Chatanika, and Tolovana rivers and Goldstream and Washington creeks. It drains into the Tanana River in a generally southwest-west direction. The flats are bounded on the north by an escarpment which rises abruptly from the lowlands. The Tanana River forms the southern boundary. Minto Flats exhibits most of the weather characteristics typical of Interior Alaska's continental climate. Low precipitation, warm summers, and intensely cold winters are the rule. The area is noted for its northerly and easterly winds, which are markedly stronger and more persistent than in surrounding areas. Low temperatures are similar to those experienced in Fairbanks, but severe wind chill factors often accompany them. The mosaic of ponds, oxbows, stream channels, and various wetland and upland vegetation types provides excellent habitat for waterfowl, big game, and furbearers, as well as anadromous and resident fish species. The area has traditionally been and remains an important area for harvesting fish, wildlife, and other resources for Athabaskan Indians and others living in Minto and Nenana, and also serves as an important fish and wildlife use area for Fairbanks North Star Borough residents. 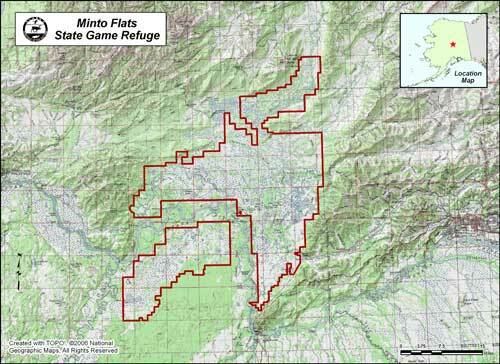 For more information on the Minto Flats State Game Refuge please refer to the Minto Flats Management Plan. For current land status information, see the Minto Flats Land Status Map (PDF 1,007 kB). You may also download the KML file which depicts the refuge area boundary.